www.ilikeyourty.com - wip blog: Zbrush3 Materials - EMAIL ME YOUR RESULTS!!! 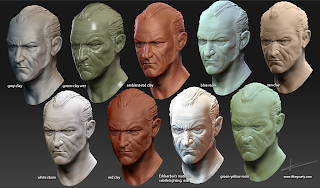 Zbrush3 Materials - EMAIL ME YOUR RESULTS!!! So over the past few days I put together a pack of materials based on different casting and sculpting materials. I didn't create Erklaerbar's material from scratch, just adjusted the intensities and such. I didn't ask for permission from Zbrush Central member Erklaerbar, but I really liked his shader pack and this one was one of my fav's so I included it. Other than that I created every material from scratch and I feel as a first shot they turned out pretty good! I hope everyone enjoys them! If you do end up using them on your models drop me an email so I can see how it turned out!